One of the biggest criticisms of the Sirleaf's administration has been the government's inability to revitalize the Roberts International Airport, viewed by many as the gateway to Liberia. The poor condition of the runway is believed to have been a driving force behind Air France's abrupt pullout last year while many departing and arriving visitors and Liberians have not hidden their distaste for the unimpressive terminal which many say does not represent Africa's oldest republic. The French carrier, Air France, in 2014 ended its flying route to Liberia after poor and dilapidated runaway conditions at the RIA inflicted serious damage on the airline's AF752 jet, forcing the plane into rugged landing leading to almost half a million dollars in damage. The forced landing ruined the plane's bottom right, main landing gear, hydraulic holes, brakes, and right main landing gear axle assembly. The airport suffered severe damage during the civil war in 1990. The runway was bombed and the main terminal building burned down. Both the runway and the terminal building became inoperable and the airport was shut down. Commercial operations at the airport started again in 1997 by converting a cargo building to a terminal. In recent months, speculations have surfaced that the government has been toying with the idea of constructing an airport city but sources tell FrontPageAfrica that those plans have been shelved for now, replaced with a more realistic plan to revamp the old terminal which was ruined during the civil war. Government sources say the funding for an airport city is costly and would take years to raise funding which is why the administration has settled on revamping the ruined terminal building and leave room to incorporate an airport city in the future. Dr. Clarence Moniba, head of the President's Program Delivery Unit at the Executive Mansion, speaking to FrontPageAfrica recently, confirmed that the plans for both the runway and terminal are in the works. Moniba explains that the President, in her efforts to continue to modernize Liberia's lone international airport, has decided to approach its reconstruction and development in two related, yet separate phases. The first decision, Moniba says, focuses on the building of a modern terminal within the next two years. "In consultation with the Cabinet, it has been decided that several companies will provided financial, as well as an architectural rendering of a proposed terminal. One of the key requirements for their submission, is that it will be pre-financed by the company and paid back over several years of budget allocation. The President, in order to ensure the quality of the proposed structure, has insisted that procurement be done to recruit the services of an independent and internally-recognized contracting firm to serve as the Owner's Engineer(OE) to oversee the construction of the Terminal." The next decision reached by the full Cabinet, Mr. Moniba says, focuses on a broader and longer term approach to the airport. "As international airlines continue to gain interest in utilizing Liberia's strategic location, it will be key to build an airport city that will not only boast a modern terminal, but in addition to that, conference halls, an expensive hotel network, an airport industrial park and warehouse, air cargo and logistics, as well as offices. These initiatives, it is envisioned, will be implemented over the next decade/foreseeable future." The new Modern terminal will include updated security and immigration features, shopping center and passenger amenities and host two large body planes at the same time. The departure Lounge will host a minimum 500 people at a time; there will be two large conveyor belts for arriving passengers; there will be also be two jet way walking bridge to enable passengers to walk directly from the terminal onto the aircraft. The current terminal has the capacity to handle 330 passengers every 30 minutes, and passenger numbers currently stand at 115,800 outbound and 112,500 inbound as of the last operational year. Given the current trajectory, total passenger numbers for RIA are projected to grow to at least 450, 000 over the next few years. Officials at the Liberia Airport Authority say there is the potential for a further significant increase in both carrier and passenger numbers over this period as investments in Liberia continue to increase. The other portion of the RIA redevelopment involves the dilapidated runway. The estimated cost of the entire RIA modernization and rehabilitation project has been put at US$60.3 million, and the Government of Liberia has already concluded arrangements for the project to be financed by several means including the Saudi Fund for Development which is providing US$20 million; the Arab Bank for Economic Development for Africa which is providing US$10 million; the Government of Liberia, US$3 million, and credit from the European Investment Development Bank, US$27.3 million. In November 2014, the European Investment Bank (EIB) agreed to provide Liberia with a US$27.3mn loan facility over 20 years to rehabilitate the RIA. The EIB's long term loan is expected to address safety issues and commence the upgrading of the runway. Earlier this year, the Senate received for ratification the EIB loan agreement in the amount of US$27.3 million. Currently only a few airlines operate at the RIA: Brussels Airlines, Royal Air Maroc, Kenya Airways, Air Ivoire and the cargo airlines DHL Delta Airlines. Air France previously used the runway but have since discontinued flights to Liberia. The airport upgrade is essential for Liberia and the investment will allow Liberia to rehabilitate and re-brand the airport, ensuring a compliance with international civil aviation standards. The Scope of the rehab will focus on the improvement of the drainage system, construction of the runway, and improvement of the runway lightning system. 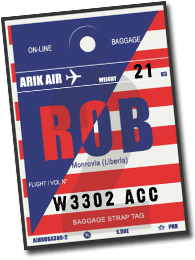 The project, which is being implemented by the Liberia Airport Authority (LAA), also includes the provision of assorted items of operational and safety-related airport equipment; to include among other things, fire tenders, ambulances, firefighting equipment, forklifts, conveyor-belt loaders, passengers' stairs and passenger buses. The airport was initially built with two runways but now has a single 3,400m-long runway. Two aprons were constructed in asphalt pavement measuring around 57,000m2. They were extended by 85,000m2. The secondary runway was abandoned and is currently being employed as parking area for off-duty military aircraft. To date, four companies - Effiage (France); Lagan (Irish); Sinohydro (China) and Dawnus (British) have submitted bids but it is unclear which company is likely to be awarded the contract. The RIA has an asphalt runway measuring 11,000 ft (3,353m), which is being used by international carriers. The RIA currently uses two of its ancillary terminals and its asphalt runway to service international carriers as well as the United Nations Mission in Liberia (UNMIL). UNMIL maintains a helicopter and an airplane facility at the same airport. With less than two years remaining, the airport rehabilitation is seen as key to the Sirleaf's development agenda. Bearing potential bottlenecks and bureaucratic loopholes, the race against time is in already in play to see whether Liberia will have a semblance of modernity to its airport and at least an upgrade to its current condition. NEW AIRPORT FEATURES: Modern terminal with all of the updated security and immigration features, shopping center and passenger amenities; The terminal will be able to host two large body planes at the same time; Departure Lounge will host a minimum 500 people at a time; there will be two large conveyor belts for arriving passengers; There will be also be two jet way walking bridge to enable passengers to walk directly from the terminal onto the aircraft.